Both France and the United Kingdom have been severely affected by snow and ice in the last few days with freezing temperatures. These are the weather conditions that bikers hate the most as the presence of snow and/or ice on the roads is a big no go for them. We have had to leave our bike in hibernation and take public transport instead, which is definitely not pleasant either considering the delays that have been caused by the freezing conditions. At least snow makes a few us happy, particularly the kids. As we opened our curtains this morning, we saw a group of kids playing in the snow and making a snow man. Parked cars and bikes were all covered in snow to the extent that we couldn’t tell which one was ours! The No To Bike Parking Tax campaign unfortunately had to cancel their demonstration scheduled for this Sunday (19 December 2010) due to the adverse weather conditions and to preserve the safety of all riders. We can’t blame them for their decision as this was definitely the right thing to do. Whilst snow and ice make some people happy, including kids and those using the excuse for not making it to work, they make others extremely unhappy. 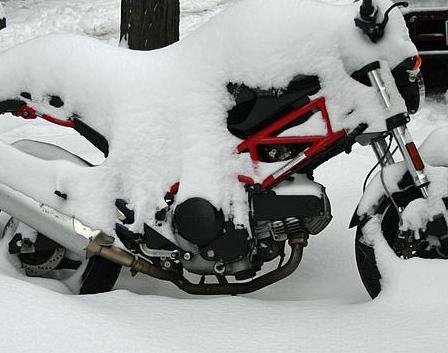 Most bikers hate snow and ice as they can cause severe accidents. Thousands of people were stranded today at home or their hotels due to the closure of both Heathrow and Gatwick airports. Public transport was also brought to a standstill and the best plan for most of us was to stay at home and be a couch potato all day really. Thanks God, it’s Saturday, some of us don’t have to make it to work! In the meantime, Westminster Council is unable to make money out of motorcycle parking as the vast majority of bikes are snowed in. Oh dear, in addition to losing substantial revenue in the last few weeks with the No To Bike Parking Tax campaigners helping out the council’s CCTV camera car drivers to do their job, the bad weather is now kicking in. In fact, whilst it is frustrating to be unable to use our bikes at the moment, at least we are delighted with not bringing any parking revenue to Westminster Council who have offered themselves the luxury to treat bikers like cash cows. We look forward to being some time in March 2011 when the most respected Chairman of the No To Bike Parking Tax campaign, Warren Djanogly, will attend the High Court of Appeal in the hope that the decision made in the first round of the trial in favour of the Council for charging for motorcycle parking will be reversed. Lord Justice Jackson has granted leave for an appeal against a High Court ruling initially made by Lord Justice Pitchford in June 2010 that Westminster City Council were entitled to use Traffic Act orders to introduce a new tax on motorcycle parking, and hoping to sell the service to other UK councils in need of a new source of income. Snow and ice will definitely not stop the appeal hearing from taking place! We wish all our readers a Merry Christmas and Happy New Year and look forward to keeping you all posted on biking developments in France and the United Kingdom in 2011. UK France bikers.com is the unique English language based website bringing you biking news in France and the United Kingdom, all in one place.